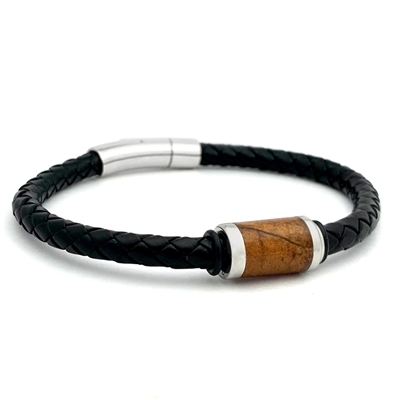 This unconventional and unique tobacco leaf genuine leather bracelet is perfect for anyone who wants a more natural, down-to-Earth look. Tobacco leaf is set in stainless steel which complements leather and creates an exquisite look. Leaf features unique patterns and marks. Inlay is sealed to prevent water damage and gives the bead a consistent, smooth finish that matches the texture of the metal. Match it with rings in our Tennessee whiskey collection, which features rings made of tobacco leaf.